The Melbourne Koryu Kenkyukai is under the direction of Liam Keeley Sensei. Liam is a highly experienced martial artist who has been practising one or another form of martial arts since he was eleven years old. Currently he concentrates on teaching two koryu, Tatsumi ryu Hyoho and Toda-ha Buko ryu, along with Chen Style Tai Chi. He has a B.A. Hons. in Social Anthroplogy from the University of the Witwatersrand, Johannesburg, South Africa. His background includes training in a wide variety of other arts, among them Okinawa Goju ryu Karate, Ryukyu Kobujutsu, Kodokan Judo, and Zulu Stickfighting. He is a Board Member of the International Hoplology Society. Liam is a member of the Tatsumi ryu, which dates from the early 1500’s, and is one of the few remaining Sogo Bujutsu. Tatsumi ryu centers on the sword, but includes other weapons such as the spear, as well as yawara (close quarter combat). 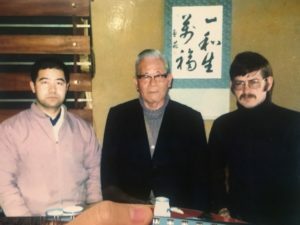 He was priviliged to have private and semi-private lessons for many years from the late Kato Takashi Sensei, the 21st Headmaster of the Tatsumi ryu, President of the Nippon Kobudo Shinkokai, and Board Member of the Nippon Kobudo Kyokai. Liam holds a number of mokuroku (licenses) in Tatsumi ryu, and has been a regular participant in demonstrating this ryu at various locations in Japan, including Meiji Jingu, the Tokyo Budokan, the World Heritage Sites of Itsukushima Jinja in Hiroshima-ken and Shimo-gamo Jinja and Shiramine Jinja in Kyoto. He is fully authorised to teach Tatsumi ryu by the late Kato Takashi Sensei and his son, Kato Hiroshi, the present Headmaster of Tatsumi ryu. Liam was introduced to the Toda-ha Buko ryu by Meik Skoss, and trained under the 19th Headmaster, Nitta Suzuyo Sensei, for about ten years. Nitta Sensei is a Board Member of both the Nippon Kobudo Kyokai and the Nippon Kobudo Shinkokai. The Toda-ha Buko ryu centers on the study of the naginata (a kind of glaive), but includes other weapons such as the spear, the chain and sickle (kusarigama), and the sword. Currently Liam holds the ranks of okuden, honden mokuroku, betsuden mokuroku, and the teaching rank of shihan in Toda-ha Buko ryu naginata-jutsu. He is fully authorised to teach by Nitta Sensei. Liam has been training in Chen Style Tai Chi under Yamaguchi Hakuei Sensei since 1985. Through Yamaguchi Sensei, Liam has been able to learn Chen Old Style as done by Wang Xian Sifu, and the New Style as done by Chen Xiao Wang Sifu. He has also attended a number of seminars taught by these highly regarded teachers.